November 30, 2017 – UN Watch today called on UN chief Antonio Guterres and rights commissioner Zeid to condemn and dissociate themselves from this week’s “fake investigation” of Venezuela by the only U.N. human rights expert to be allowed in by the Maduro regime after 15 years of it rejecting repeated requests by separate monitors on arbitrary detention, freedom of assembly, freedom of speech, independence of the judiciary and arbitrary executions. 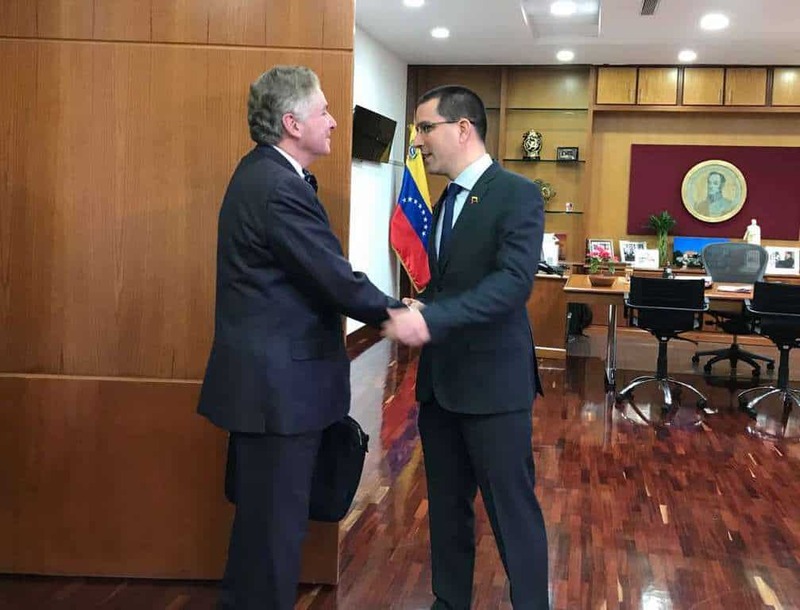 Many Venezuelan NGOs expressed suspicion about the visit and called on Zayas to meet with human rights defenders and speak out for Maduro’s victims while in the country. Arreaza greeted Zayas warmly with smiles and handshakes, hosting a meeting with him at the Foreign Ministry. Arreaza has already used the visit to spread government propaganda, seeking to deflect blame for the humanitarian crisis engulfing the country. The meeting was followed by a press conference, a government press release and multiple tweets by the Foreign Ministry (@CancilleriaVE), and was widely covered in the press. One self-serving tweet proclaims that Zayas “will soon meet with the people’s power without any kind of restriction.” It is unclear who this is referring to, but there is no indication that Zayas met with political prisoners or opposition leaders. The Maduro regime clearly views Zayas as an ally. According to Arreaza, the pro-Castro U.N. expert was invited (even as Venezuela denied entry to other UN experts) during the September 2017 Human Rights Council Session. This was a transparent bid to deflect criticism of the Maduro regime by UN rights chief Zeid Hussein, whom Arreaza accused of attacking Venezuela. The fact that de Zayas is cozy with the regime is no secret. In the September UNHRC session, Zayas sat on a Venezuelan-chaired panel of pro-dictator UN experts who attacked the West and defended Venezuela. Also on the panel were Jean Ziegler, founder and recipient of the now-defunct “Qaddafi Human Rights Prize”; and ex-Algerian ambassador Idriss Jazairy, who took $50,000 from Russia and then issued a report claiming that the Putin regime is a victim of Western sanctions. On the political violence in April and July, Arreaza lauded the government for responding with “democracy” to the opposition’s use of “the street, pain and death to justify – as in 2002 – a change of government by force.” This, after 163 protesters were killed and 15,000 injured in anti-government rallies in 2017, and the government stripped the National Assembly of its legislative powers. Not surprisingly, the government press release concluded with a statement that it expects Zayas to issue a UN report reflecting his “balanced and rigorous opinion on the Venezuelan reality.” Russia likewise received a positive report from Zayas’ close ally, UN expert Idriss Jazairy. This, while Venezuelans are starving on a massive scale, with 75% of the population having lost weight in 2017 (some as much as 78 pounds), girls as young as 12 being forced into prostitution to feed their families, acute malnutrition rising from 8% to 12% in the first half of 2017, and record high levels of malaria which is not being adequately treated due to lack of medicine. Zayas’ press release also suggests Venezuela’s human rights catastrophe is the making of outsiders, not the Venezuelan government, stating “human rights and development cross borders in today’s globalized world,” and there is a need to “strengthen relationships to overcome obstacles” to civil liberties. His press release notably fails to mention Maduro’s many crimes: jailing political prisoners, silencing of opposition leaders, torture and killing of protesters, causing mass hunger.